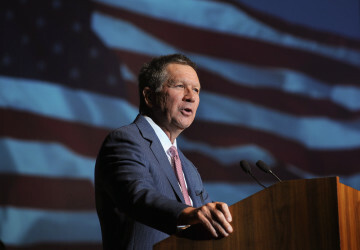 As part of a broad national security plan to defeat ISIS, Republican Presidential candidate John Kasich proposed creating a new government agency to push Judeo-Christian values around the world. The new agency, which he hasn’t yet named, would promote a Jewish- and Christian-based belief system to four regions of the world: China, Iran, Russia and the Middle East. He defended creating a new government agency at a time when fellow Republican presidential candidates discuss eliminating government agencies to making the government smaller. If he wants to spread American values such as freedom and respect, the United States already has the Voice of America for this. It is a different matter if he wants to spread religious values. The main problem addressed in most media reports is of establishing a new government agency, in violation of Republican dogma. There are bigger problems. First this violates the First Amendment, although Republicans are generally only concerned with the Second Amendment and have never shown any respect for separation of church and state. There is also the question of how this will be received in other countries and how they will respond. Trying to spread Judeo-Christian values in Muslim dominated regions would provide yet another recruitment tool for ISIS. This would be a surprising proposal if coming from a moderate Republican, but Kasich has never really been all that moderate. Posted in Separation of Church and State, Terrorism. Tags: ISIS, John Kasich, Separation Of Church And State, Terrorism. RSS feed for comments on this post.. TrackBack URL. Off topic, but following the orchestrated howls and shrieks over the fate of Trayvon, so far not a word about Tayshon! Er, that's Tayshon Lee, by the way, a 9-year-old boy deliberately executed in Chicago – where else? So where's Jesse Jackson, a Chicagoan himself, and why hasn't he organised a huge demo? And where are those other former Chicago residents, B. Obama Esq. and his deeply caring wife who take every opportunity to bewail the fate of black Americans, er, well, they do when they're shot by non-black Americans?! And not a word on this distinguished, er, 'liberal' blog? You clearly don’t understand what a blog is. A solo blog such as this can only deal with limited topics. Right now it is almost exclusively on the primary battles, and primarily on the Democratic race (other than for the weekly science fiction/television post which continues regardless of the main topic of the blog at the time. I have not blogged about either Travon or Tyshawn Lee. There is also no major political issue involved for me or any politicians to talk about. Police are investigating the shooting. Apparently Kasich doesn't think our existing agency used to spread Judeo-Christian ideology across the world is suficient, the US military? Good one JimZ! I'll be happy when Kasich drops out. It has been years now, but I remember a line from Rush where he described Obama's missile strikes on Libya as "kinetic humanitarian aid". BTW, I was listening to Elisabeth Warren on CSPAN last night. While I disagree with the extent she would like tax code changes, I think she made a good, compelling case, on some of the corporate loop-holes that should be eliminated. Sadly, as we all know, so many politicians are bought off by corporations on both sides of the aisle, it wouldn't surprise her, or me, that things get changed even more to big corporations favor rather than more balanced.